I bought some fresh cranberry beans from a nearby farmers' market this past weekend. I love cranberry beans and haven't seen them dried (or fresh) for sometime now. I sauteed some onion and baby ginger in a small Saladmaster stock pan for a few minutes, then added the fresh beans, enough water to just cover the beans, a diced carrot, a green (not quite ripe) tomato that I also bought at the market, a vegan bouillon cube, garlic powder, and salt. I brought to a boil and cooked, uncovered, for about 5 minutes, then covered and simmered on low heat for 20 minutes. I then mixed in a chopped roasted bell pepper that I had also purchased from the market, and served, along with a cucumber-caper-Ume plum vinegar salad and brown rice noodles. I was going to serve the beans as the main course, which I did, but it turned out a soup rather than a more firm plated dish. I am not normally so excited about soup, but my whole family loved the entire dinner, especially the soup. It came together so nicely and with just the right punch of flavor. Wow! I love cooking with my Instant Pot, but it was fun to make a bean dish stovetop today. Of course, the convenience of dried beans is great, but I quite enjoyed using fresh beans today and should look for them again. I should make more fresh bean soups and regular bean dishes. The hurricane is slowly passing us by and finally we had some sunshine today - but also tornado warnings this morning, a lot of rain, and nearby areas experienced flooding. We are lucking out and haven't even lost power, but I'm still focused on bringing down my frozen food inventory. I recently bought frozen riced broccoli (blanced organic broccoli and salt), and decided to cook it waterlessly (I just put it in my small Saladmaster stock pan, covered the pan and heated it on medium high until the vapor release started jiggling, then I reduced the heat to low till the jiggle stopped. I let it cook for about 7-10 minutes, really just to defrost and heat up. I made a "cheese" sauce to serve atop the broccoli by blending soaked cashews, water, nutritional yeast, garlic, salt, and, for color, a little bit of tomato and red bell pepper. 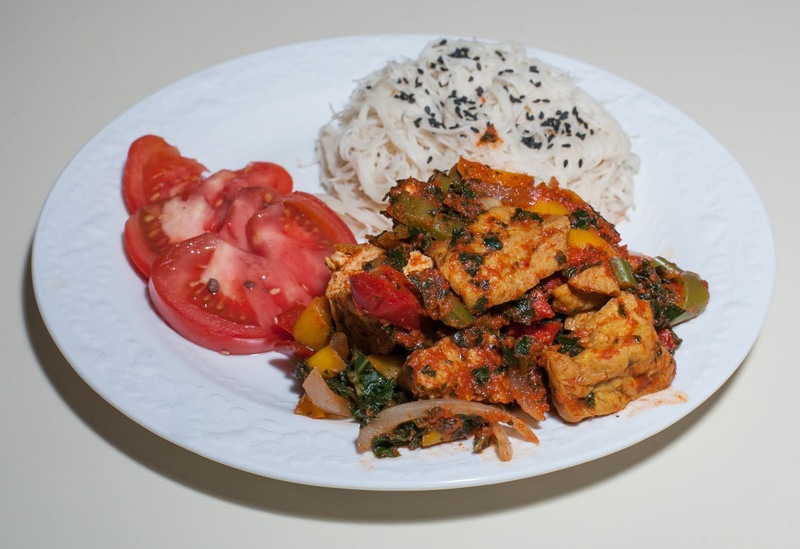 I mentioned in the recent past about, for me, a new tofu company called Hodo Foods . I bought their braised tofu and used it with dinner as the main course by sauteeing with bell pepper and onion (on cast iron with no oil); my wife doesn't eat tofu as it doesn't agree with her, so her serving was of tempeh instead of tofu. Hurricane Florence is bearing down on the Carolinas and I am concerned about those who live or have property along the shore. I remember living through Hurricane Fran, which was scary, and that was a category 3 storm; this could hit category 5 and be much more destructive. However, I'm hopeful that by the time it hits our area, we'll get perhaps 30-40 mph winds, which wouldn't be bad. With that as a long preamble, we are not going to be surprised if our power goes out, so I thought I should start eating up frozen foods. If we do lose power and have frozen foods, they will quickly spoil and need to be discarded. I had a favorite frozen pizza, Vegan Harvest by American Flatbread on hand; I love its crispy crust and find it better than some pizzeria pizza. I also made a waterless broccoli dish with broccoli, kale, garlic, onion, lemon juice, turmeric, garlic granules, and salt. I recently found a nice breakfast dish with organic grains and quinoa called a Cinnamon Vanilla "Toastable", which I served with organic raspberries akin to dessert. Dinner was good. I love the pizza and am glad that I had a big serving of the vegetables (and seconds) so that I only enjoyed one slice; it's good but not low in fat. The vegetables were quite good. My daughter didn't like the "toastable", but my wife and I did. It would indeed be good with breakfast, but was nice with our dinner. I should get these toastables once in a while and use them with breakfast or again try them with dinner. A fruit sauce or maybe a little melted chocolate and chopped fruit would be good atop the toastable. The day before yesterday when I was shopping at Weaver Street Market Coop, I found products from a new company called Hodo that looked appealing (and they were on sale). I bought their Thai curry nuggets as well as braised tofu with Chinese five-spice. The nuggets are great! They have very nice flavor and a chewy texture. They are great right out of the package, but today I decided to cook them with vegetables and red curry paste, and serve with brown rice noodles (my wife and daughter were away so I could cook tofu, which my wife has problems digesting, since I was cooking for myself). The nuggets are a bit high in fat; the whole 8 ounce package has about 17 1/2 grams of fat. For tonight's meal, I used maybe a third of the package, so will call this about 6 grams of fat, which isn't bad. I simply sauteed (with no oil) some onion, garlic, kale, bell pepper, and the nuggets, mixing in red curry paste. I served with brown rice noodles topped with black sesame seeds and tamari sauce. The tofu is delicious right out of the packet so it's no surprise that dinner was very good with all of the other flavors cooked together. In hindsight, the red curry paste didn't go great, but I used it to add more heat to the tame curry. Though I had mentioned garlic, I actually forgot to cook with garlic; the dish would have been even a slight bit better with garlic. I love this new tofu product and only wish that it were lower in fat. I may contact the company and see if they might consider a baked or even air fried product. I should continue to make dishes like this when I'm not cooking for my wife, but don't need a curry paste. Perhaps a hint of lemon and miso dressing may be nice. I like the vegan frozen black bean and corn, as well as the kale and pinto bean, pupusa (thick stuffed corn tortilla) that have been available over the last 6-12 months. The pupusa is from El Salvador and Honduras and these frozen convenience foods are sold by Tres Latin Foods. I had some black bean and corn pupusas on hand and used them for dinner. My wife went out to a performance. My daughter was slightly under the weather and asked for soup. I thought I'd make some butternut squash soup, and I mixed corn in. Two pupusas topped with salsa, as well as romaine lettuce completed the meal. Dinner was very good! I'll have to make this dinner for my wife. The corn was a surprisingly good addition to the soup. I should experiment with soups more often. I like chunky soups and wonder if some air fried beans or seitan might be nice in soup. For dinner today, I wanted to use some beans but hadn't soaked any. This is the reason I keep a few cans of beans around; I had a 15 ounce can of organic "salad beans" (chickpeas, kidney beans, pinto beans). I did a waterless preparation of the beans with onion, garlic, kale, and mixed vegetables cooked in a Saladmaster stock pan. I covered the pan and heated it on medium high until the vapor release started jiggling, then I reduced the heat to low till the jiggle stopped. I let it cook for about 20 minutes though 10-12 minutes would have been enough (I just wasn't ready to serve). I mixed some red curry paste with millet and brown rice ramen. 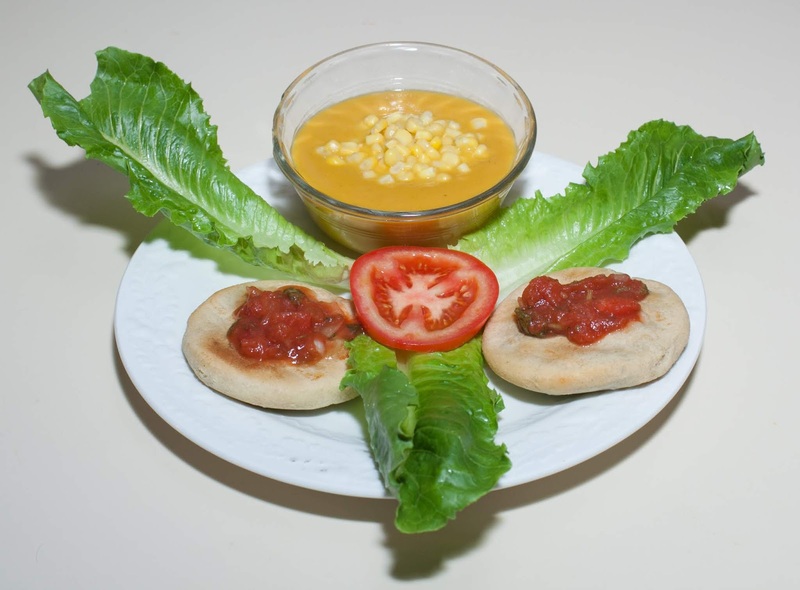 The bean mixture went atop, and roma tomato thirds triangulated the plate. Dinner was good! The curry paste was just spicy enough for my daughter and I liked it; my wife added some hot sauce. 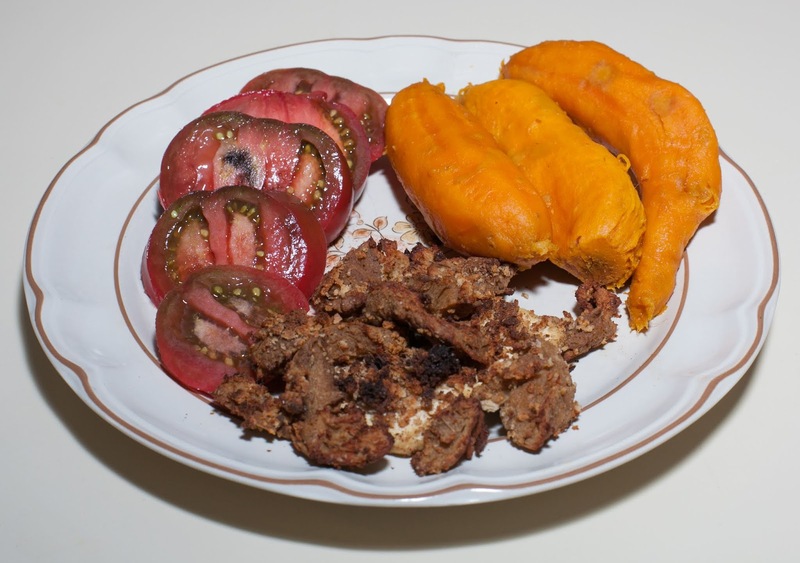 I was pleased about how easy, nutritious, and quick this meal was! We all like curry pastes; I should cook with them more often. I'm glad that Thai Kitchen brand has a variety of marked vegan sauces. I occasionally teach Thai vegan cooking and show students how to make curry pastes in a mortar and pestle; it's not difficult but takes a bit of time. My wife and daughter are traveling this week, so I was on my own for dinner. I coated seitan in panko bread crumbs and jerk seasoning, but the coating didn't stick so well (I should experiment with vegan "egg" additions in such situations), so I also coated a piece of tofu, which takes coating well. I air fried for 5 minutes at 375°F. I had some small sweet potatoes and pressure steamed them for only 9 minutes in my Instant Pot; I could have gotten away with perhaps only 6-7 minutes! Dinner was good and I should replicate this for my family. The seitan, not nearly as moist as the tofu, was just a bit overdone but actually still quite good. If there were some lemon, it would remind me of my signature lime marinated jerk seitan dish. The tofu was good but could have been air fried for a few more minutes. It was fun to eat three sweet potatoes! 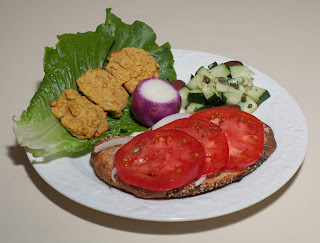 I might experiment with adding lemon zest to the breading of seitan - and mix in some yogurt, a vegan "egg", or maybe lemon or orange juice to the breading to help it to stick to seitan. Some sesame seeds would also be nice but I'd be concerned that they might burn.